Civic Militarism in the Ancient World was the foundation on which the Civic Militarism of the modern world is set. Last week we spoke about the Marriage of Rationalism and Capitalism. The non-Romans and Greeks of the ancient world often raised massive armies—the Germans, Gauls, Africans, and Persians. Hundreds of thousands of Germans went to war under Ariovistus to fight the Romans. A quarter million Gauls joined Vercingetorix to fight Caesar. Hundreds of Thousands of Persians invaded Greece. The list goes on. These tribal musterings and mercenary armies by no means equated to a true nation at arms; and not one of these multitudinous enemies ever grasped the duel nature of Roman or Greek civic militarism coupled with the free land owning citizen; which created the dynamic combination of the citizen soldier. These vast armies fielded by the enemies of Western Civilization remained at heart, armies of a season; bound to a magnetic leader; migratory or ad hoc musterings lacking the contractual agreement seen between a citizen soldier and a consensual government; fighting for land or plunder. When these armies were sated they melted away. When defeated, they disbanded. Vercingetorix, leading a quarter million Gauls against a greatly outnumbered Roman Army, never once understood that the army he faced was but a percentage of the might of Rome; which could be measured in the depth of its civic militarism rather than the number of men on the field. The advantages of this dual system that created the citizen soldier can be seem most clearly in the aftermath of the disastrous defeat at Cannae, when Hannibal destroyed a Roman army numbering 80,000. Much of southern Italy stopped sending men and material to Rome. The rich city of Capua defected to Hannibal, followed quickly by others in Campania and Apulia. A Roman Army in Spain, under the Consult-Elect Postumius, was annihilated, seeing another 20,000 Roman soldiers killed. The Carthaginian fleet raided the Coast of Sicily at will. Half the Consuls elected from 218 BC-215 BC were killed on the battlefield. How did Rome react to these disasters? Once calm was restored, the Senate met and issued a series of systematic decrees that were reminiscent of the decisions the Athenians made after the disaster of Thermopylae, the Byzantines after the collapse of the Western Roman Empire, the Venetians after the fall after the fall of Cypress, and America after the bombing of Pearl Harbor. Marcus Junius was declared dictator and began the process of rebuilding the Romany Army. More than twenty thousand men were mustered into four new legions and orders went out for another 80,000 auxiliaries to be raised. Weapons and armor were in short supply, as the majority of all armor and weapons fabricated in Italy over the past decade were now in the hands of Hannibal. 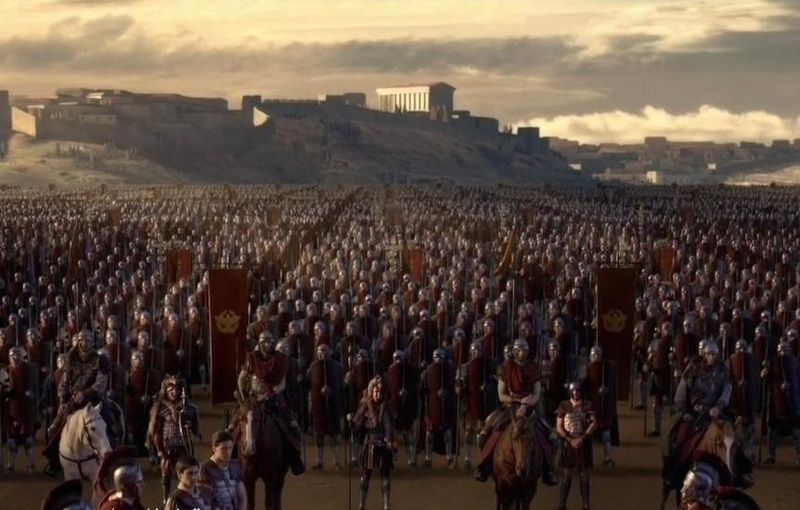 Rome went on to muster, train, and equip two legions per year each year for the duration of the war. Within a year of the defeat at Cannae, the Roman Navy was on the offensive off the cost of Sicily, all the losses sustained at Cannae had been replaced, and the now three times defeated legions were twice the size of Hannibal’s victorious army. The contrast between the defeated armies of Rome and the victorious armies of Hannibal are striking. Rome, in the very teeth of defeat, managed to harness the vast military manpower inherent in a population composed of free land owning citizens; and connected the economic might of a consensual government and a capitalist economy. Hannibal’s victorious army settled into their winter quarters in southern Italy and scrounged for food and equipment while Hannibal’s pleas of support fell on deaf aristocrat Carthaginian ears. The capacity to wage unlimited war: the ability to consistently muster, train, and equip vast quantities of free land owning citizens into a consensual agreement between the citizen soldier and the consensual government; is a force of such power that there can be no surprise that the result of the Punic Wars was a victorious Rome and a crushed and forgotten Carthage. Before World War II, America’s armed forces was 19th in the world, a total of 334,000 men under arms in the Army, Navy, and Marine Corps. Like the Romans before them, America rose as a nation at arms waging a war of unlimited manpower and resources; mustering, training, and equipping 16.1 million men. That is the power of civic militarism and the last of the principles of a Western Civilization. The next article will begin a series on Landmark Battles.